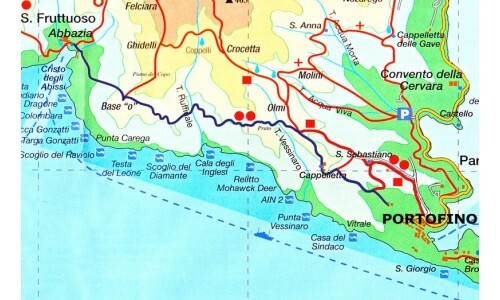 Using the amazing http://www.portofinotrek.com and suggestions from Pall Forloney, the TrekGuyd, I have come up with the route for my Portofino hike. Note that all the text that is not in bold has been taken directly from Portofino Trek. Portofino Trek has a detailed website with great, clear maps, detailed directions, and even pictures of key points along a number of routes through this area. They also categorize each trails by level of difficulty and travel time. It’s a great resource! While surfing the web I came across Pall Forloney’s website. Pall is an American ex-pat living in the Cinque Terre, operating a guide service. I reached out to him in hopes that I might utilize his knowledge and company on a hike, while I am in the area. It turns out Pall will be away on business while I am there, but he has been super helpful in corresponding with me by email, answering questions, and making suggestions for great hikes. Thanks Pall!! My Portofino hike will start in Camogli and end in Santa Margherita Ligure. Camogli is a delightful fishing village on the Ligurian Riviera di Levante, protected behind the promontory of Portofino, which allows it to enjoy a mild climate all year round. The village consists of a pedestrian promenade, bordered by tall, colorful houses, which, in a succession of restaurants, bars and shops original comes to the Basilica of Santa Maria Assunta, and then the harbor crowded with fishing vessels and boats to tourists. From this point, by sea, it is indeed possible to reach many places like Punta Chiappa, San Fruttuoso and, with day trips to the Cinque Terre. A must see is the castle of Dragonara, the fortress built around the thirteenth century, nestled on the beach that also hosts an interesting archaeological museum (the aquarium, this until a few years ago, he was transferred to Genoa). Camogli is the starting point of many direct paths to the Park of Portofino; a trail from the parking area up to San Rocco di Camogli, where you can go to Portofino Vetta, Pietre Strette, San Fruttuoso, Punta Chiappa. During the summer months and on weekends, it is difficult to park your car; most of the parking is reserved for residents and parking spaces available to tourists (paying) is often full, so we strongly advise public transport. Camogli is well served by trains, buses and boats. 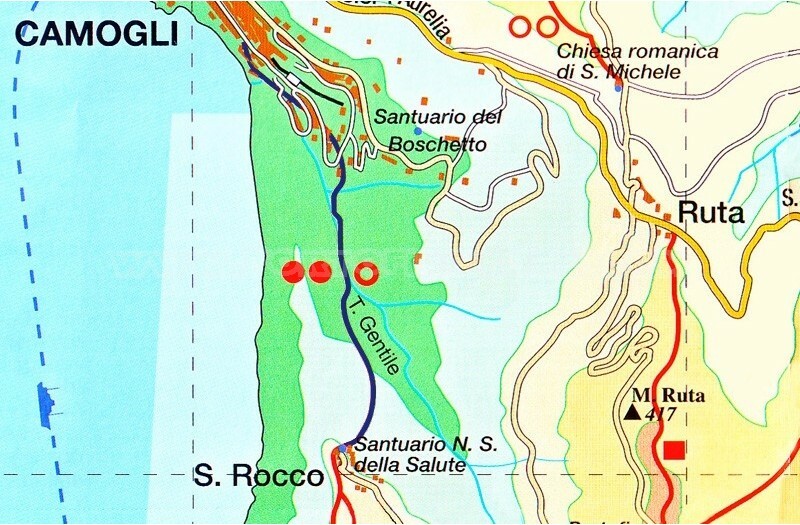 For the first section I will be trekking from Camogli to San Rocco di Camogli. This leg is low difficulty and slotted to take thirty minutes. While my starting point is Camogli, some of the towns along the way, like San Rocco and San Fruttuoso, end with “di Camogli”, which has been a bit confusing! This path, although not a real route, but rather the access road to the Mount of Portofino for those leaving from Camogli, it is a nice transition between the “creuze”. The trail begins on Via del Boschetto, the small driveway at the end of the parking lot, past the Police Station, advancing along the Gentile river. The trail continues with a climb, consisting mainly of stairs, winding through olive groves and tall walls that hide beautiful villas and rural homes, but leaving a glimpse of some interesting views of Ruta di Camogli. The last section of stairs comes from the colorful houses in the churchyard of the San Rocco di Camogli’s church. San Rocco di Camogli is a quiet village surrounded by green, at 300 meters high, dominating the Golfo Paradiso. Particularly striking is the view that can be seen from the churchyard of the parish church, facing the sea. Throughout the year, but especially on weekends, San Rocco is very frequented by hikers that start from here to walk the various paths of the promontory of Portofino. The locality is also famous for the event “International Prize Fidelity of the Dog”, which takes place every year on August 16, during the patronal feast, and gives recognition to the dogs that were known for their loyalty. 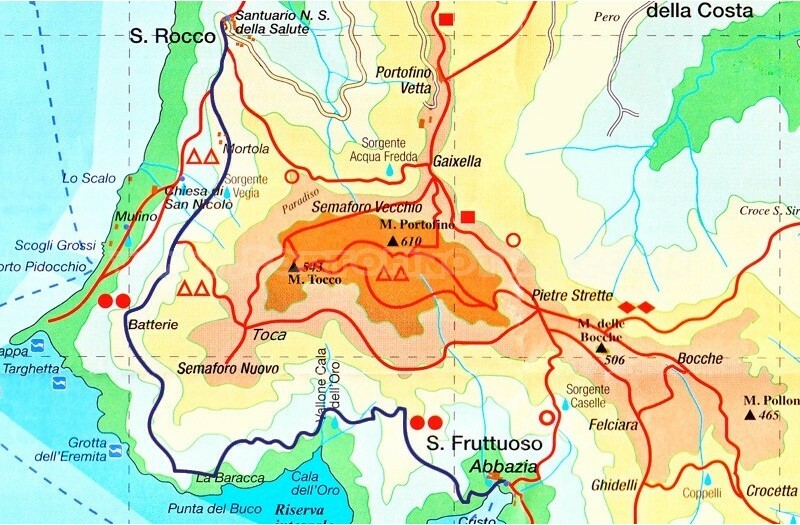 For the second leg I will be descending from San Rocco and continuing on a more strenuous path to San Fruttuoso. This leg is rated high difficulty and slotted to take 2 hours and 40 minutes. Leave San Rocco to take a path that is certainly among the most evocative of all the cape, but in some places is quite challenging. It is therefore advisable to wear shoes suitable for uneven paths and carry a good supply of water (on the way, very sunny in summer, there are no fountains or taps). The journey begins with the road, starting from the churchyard of the church of San Rocco, along the coast. After a few minutes, past the stairs leading down to Punta Chiappa, through the village of La Mortola, is a very typical small group of houses. Moving away from the town the path goes into the woods and arrives, after approximately 20 ‘in locality Fornelli, from which, on the left, you can go to places Pietre strette. Continuing straight after a stretch of sloping steps follow some ups and downs of rock irregular but easy to follow that, out of the woods, overlooking Punta Chiappa, Camogli. After about 40 ‘from the start you get to locality Batterie (246mt. above sea level), a magnificent lookout over the bay, where you can see the remains of bunkers dating back to World War II. Once you get to Pass of the kiss , the path becomes a little more challenging for some points where you have to jump on the rock overlooking the sea. The use of chains (sometimes redundant) facilitates the transition, especially in a short stretch where the rock has few points of support for the foot. Small difficulties are rewarded by a breathtaking view of Cala dell’Oro, and Punta Torretta and the intensity of the blue sea below us. The path forward, a little narrow and bumpy, with some ups and downs of rock steps, until the crossing of a stream in dry (the presence of some chains indicate the presence of water in some periods the of the year). Here, paying attention to the signs (the path is not clearly delineated), continue on the path that begins to rise. The climb, very steep and tiring, the first section begins with a very sunny and for advancing through the woods and reach, in about 40 ‘, the peak near Punta Torretta. The last part of the course, all downhill, develops in the middle of trees and ends after 25 ‘, the pier, opposite the spectacular Abbey of San Fruttuoso (5mt. above sea level). San Fruttuoso, located in a small bay, the promontory of Portofino, is undoubtedly one of the most particular and fascinating of Liguria. is exciting, as it descends from the mountain or approaching from the sea, appear to see the Abbey of San Fruttuoso Capodimonte that stands out from the turquoise sea and the green of the surrounding vegetation. The monumental complex, owned by the FAI in 1983, was built in stages, starting from the end of the tenth century and includes the church with its bell tower, the monastery (which now houses a museum) and the cloister in which is home to the tombs of some members of the Doria family. Is also worth a visit Torre Doria, which can be accessed from here, with a steep staircase. To complete the village some fishermen’s houses and typical restaurants located directly on the two small beaches offering fresh seafood. San Fruttuoso is accessible only by sea, the boat service that leaves from the Golfo Paradiso and the Golfo del Tigullio. It is within walking distance, through the numerous trails in the park from San Rocco, from Portofino Vetta Portofino Mare. Exclusive privilege of the divers is instead an excursion to see the Christ of the Abyss, a statue of 2.50 meters, situated on the sea floor at the entrance of the bay (when the water is very clear you can not even catch a glimpse of the boat) . 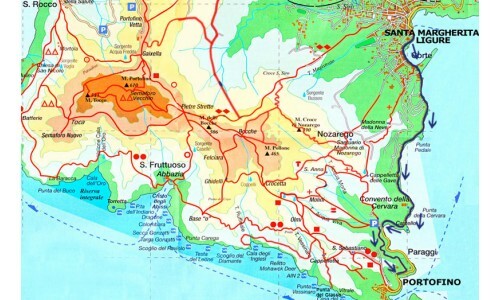 The third leg of this trek will take me from San Fruttuoso to Portofino. This portion is rated medium difficulty and is slotted to take almost 2 hours. Along the way there are no sources of water so it is advisable to make a sufficient supply before leaving. From the small square in front of the church of San Fruttuoso take the small road, passing under Tower Doria, leading to the pebbled beach and goes between the houses of fishermen. Arriving at the base of the helicopter landing awaits a steep uphill climbs, and irregularly in the woods giving you some wonderful views. After about 40 minutes you are in a detour, Base 0, the military post World War II. On the left, climb to Portofino Vetta, you, however, keep the right path that follows the western side of the Promontory. The path is now little challenging, but incredibly beautiful. The trail, which alternates between up and down to the plains to numerous protruding boulders, runs entirely on the sea showing the bays below. Only at the point you get away from the ridge to cross a valley shaded source of relief in particularly sunny days. Come to a junction, near some houses, go straight down a steep but short road that leads to a grove of chestnut trees. Shortly after, in the locality Vessinaro, miss the right turn that goes down to Cala des Anglais, to keep up the narrow path and level that advance hour surrounded by countryside. At the fork (the left goes up to Portofino Vetta) continue straight to reach the places Cappelletta, where, beneath a small chapel, find a gate that you must cross. Get off the trail, ignoring deviations and pass through the short tunnel of vines to cross a second gate. The last stretch of the trail consists of a large and well-kept staircase of stone and cement down surrounded by shrubs and ends on a road. Go past the hotel and following the road, and then to Via Fondaco all’entrate in the square of Portofino. Portofino is a place known throughout the world because the destination of many personalities from the worlds of entertainment, politics and celebrities. coming from the sea appears as a a small and ancient town has not changed over the years. The first image that comes before our eyes is a group of multicolored houses, high and narrow, arranged along the bay, surrounded by lush vegetation of the Park of Portofino. Looking more closely, one immediately realizes that there has been some changes: elegant boutiques of the biggest names in fashion, have taken the place of small craft shops and luxury yachts crowd the marina, once a shelter for small fishing boats fishermen now almost disappeared. After a walk to discover the village, between the pier and the tiny “carruggi”, we recommend you visit the lighthouse, which is reached in 15 minutes with a path that starts from the famous “piazzetta”. Equally interesting are the beautiful Church of St. George and Castello Brown, the fortress overlooking Portofino from above. I found other more strenuous routes to Santa Margherita Ligure. The one that I chose does not qualify as a trek. Really, it is a paved walkway from one town to the other, along the coast. But I thought it would be a nice path for my final leg. The path is easy difficulty and slotted to take an hour. The map and trail description below outlines the trip from Santa Margherita to Portofino, but I will be taking it in reverse and ending in Santa Margherita. This is not a trekking route because it is developed, in large part, on the driveway, but we recommend it to those who do not know why this is one of the most beautiful walks to spectacular views of Tigullio that can be admired. The start is in Santa Margherita Ligure, in Piazza V. Veneto. From here you follow the promenade through the gardens and past the fish market, which comes alive in the late afternoon when the fishermen return with their catch, you can reach the marina. Beyond the port, along the beaches encountered a stone building that hosts a unique local and then another series of beaches in summer, with sun beds and beach umbrellas. Across the street, is lined with luxurious villas until you reach a small road that leads to Abbey of Cervara. Here begins a footbridge over the sea that makes it safe to be very impressive this stretch of road is very narrow and lasts until the beautiful Paraggi’s bay. Go through the tiny hamlet passing between the beaches and the houses to emerge on the road. Take the small stone steps in front of you that allows you to access the pedestrian Paraggi – Portofino. It is a promenade that runs parallel to the driveway below, but is completely surrounded by greenery and offers numerous panoramic views. After about 20 minutes of walk, the view of the harbor of Portofino, with its exclusive yachts, announces the imminent arrival of the most famous village in Liguria. Our tour ends at the church. We suggest, besides the inevitable turn in the square of Portofino, a nice walk (about 20/25 minutes), passing the church of St. George and Castle Brown, leads to the lighthouse (here, in season, there is a small and bar). After this reverse trek, I will end in Santa Margherita Ligure. Santa Margherita Ligure, also known as the “pearl of the Tigullio, is a tourist resort, situated between Portofino and Rapallo, it is very elegant and refined. The area near the sea consists of a long walk that will get you up to Paraggi; along the way, you can see the sixteenth-century castle, the fish market, the marina, and a series of beautiful beaches. In this stretch of road, which goes to the harbor, is lined with bars, restaurants and boutiques. Other shops, among them some historians are in the walking path that surrounds the church. From the church square, which is animated by the morning market fruit and vegetables, unfold the typical “carruggi” of Liguria, where you can find all kinds of products. The two main attractions of the town are Villa Durazzo, surrounded by a lush park and Cervara Abbey, a monastery overlooking the sea, which boasts a charming Italian garden, you can access the abbey with a small street running from waterfront, just before the Bay of Paraggi. Santa Margherita is easily accessible by any mode of transport, but it is recommended, especially in summer season and on weekends to use public transport; it is well connected to surrounding towns by a network of buses, but you can also use the trains or boats. By car it can be accessed by or Rapallo Recco (from Ruta di Camogli). That is my route. I am expecting a 6 hour trek, in total, and then any added time spent in the towns in bewtween. I’ll be taking the train from my home base, Vernazza, to Camogli and then returning from Santa Margherita Ligure back to Vernazza. From Vernazza, I may have to stop in Levanto, to catch the yellow train times to Camogli. I arrive in Vernazza on a Monday and return to Florence on Friday so Tuesday, Wednesday, or Thursday would be best for this trek. Let us pray for sun! It’s a gorgeous area to hike, have a blast! Thanks, Jenn. I checked out your blog and enjoyed it! You’ve been to this area? I am very stoked! Yes, I was there when I was in college. Had a great time! http://jennwinter.com/2012/03/21/riviera-through-the-eyes-of-my-20-year-old-self/ Would love to go back and take more photos, I visited before the digital age.